Sticky, tangy, sweet and savory glazed salmon paired with thinly sliced, crisp yet tender brussels sprouts. 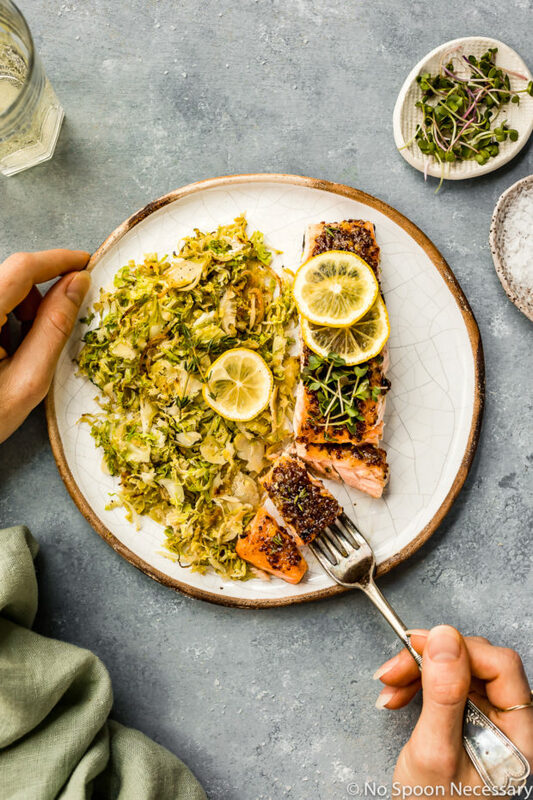 This Sheet Pan Baked Honey Dijon Salmon with Brussels Sprouts is healthy, delicious, only requires a handful of ingredients and can be on the table in 25 minutes! This post was originally published in October 2016. I took new photos, tweaked the recipe slightly and updated the post below to include more information about this Tray Bake Salmon. Plus, I added a recipe video to show you how easy this salmon dinner is to make! Hey hey haaay, friends! Happy, happy, joy, joy to another marvelous Monday. Psych! <- Anyone else remember when that word was hip? Wait. That word was hip way back when… right? Anyways, how was everyone’s weekend? I hope it was fall FABULOUS. And with any luck you spent it chillin’ out, maxin’, relaxin’ all cool. Possibly shootin’ some B-ball outside of the school. Name that TV show and I’ll give you a cookie. Moving on. Our weekend was just dandy. I spent the majority of it working on the last few Thanksgiving dishes for zee blog. Let’s just say a LOT of Turkey Day deliciousness will be coming at ya hot… immediately after Halloween. Sheet pan dinners are like a magical culinary gift you can give to yourself (and your family). I mean, they are stupid easy AND relatively fool proof. PLUS only one pan to clean… or no pan to clean if you use aluminum foil, which is always winning in my world. 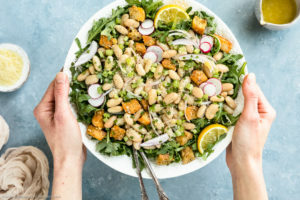 And this sheet pan dinner is seriously scrumptious AND super healthy, my friends! Sticky, tangy, sweet and savory glazed succulent salmon paired with delicate, thinly sliced, smoky, crisp yet tender brussels sprouts. Flavor bomb dot com. 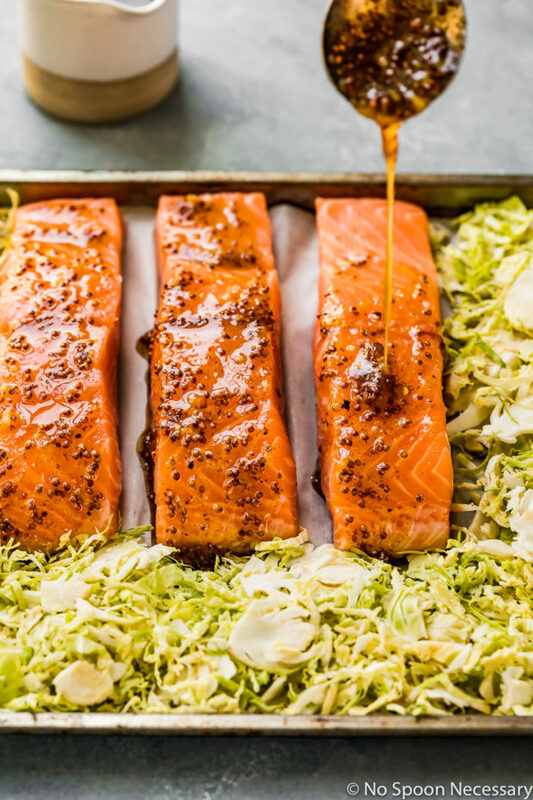 This salmon and brussels sprouts sheet pan dinner has become my go-to for hectic week nights. Shred the sprouts and pat the salmon dry. 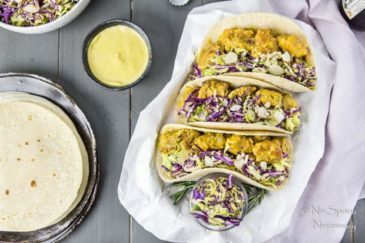 Place them each on one half of a sheet pan. Mix together the Dijon and honey topping, reserving ¼ of a cup (and adding fresh thyme) to use as a glaze later. Generously slather the Dijon and honey mixture on top of the salmon. Bake in a preheated oven for 10 minutes. Remove. Brush the reserved glaze on the salmon and toss the sprouts. Return to the oven and continue cooking for 2-5 minutes or until salmon is cooked to your desired level of doneness. Done and DONE. Go pour yourself a glass of wine, because you just ROCKED dinner. When is baked salmon done? 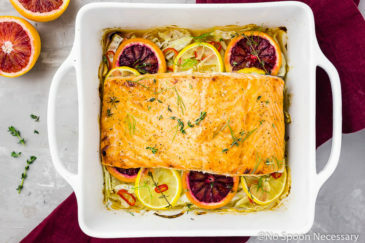 Baked salmon is such an easy, yet elegant main dish! 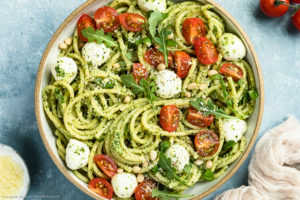 It’s simple to make, yet downright delicious and perfect for everything from busy weeknight dinners to fancy entertaining with friends. Salmon cooks quickly, so the key to good baked salmon is to not overcook it! As a guideline to doneness, salmon needs about 4-6 minutes to bake per half-inch of thickness. You can tell when salmon is done cooking when it starts to flake easily with fork and the flesh looks opaque in color. If you like to be precise and use an instant read thermometer to check for doneness, the USDA recommends salmon be cooked to a minimum internal temperature of 145 degrees F (which is medium in doneness). Can cooked salmon be frozen? Yes, cooked salmon can be frozen! Whenever I’m making salmon, I always like to make extra just to have on hand in the freezer in preparation for a hectic day. 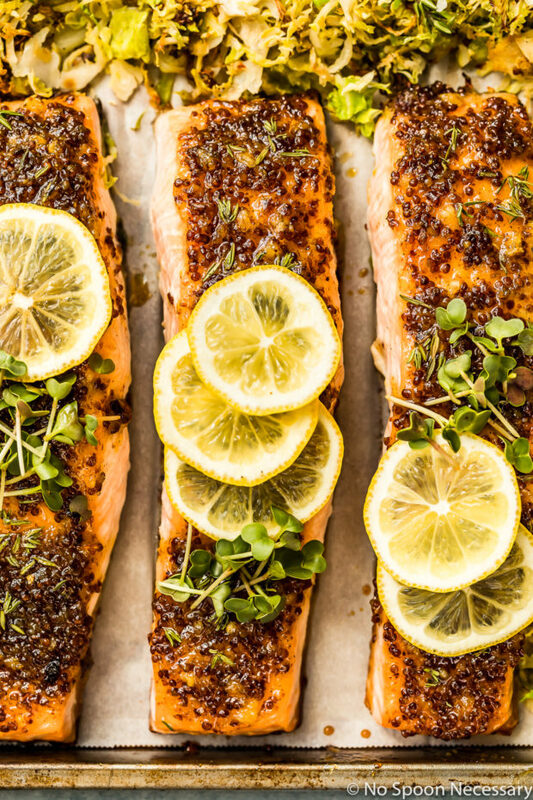 Always make sure you allow the salmon to cool completely after baking before transferring it to a freezer safe, zip-closure bag or air-tight container. Cooked salmon can safely be frozen for 4-6 months. 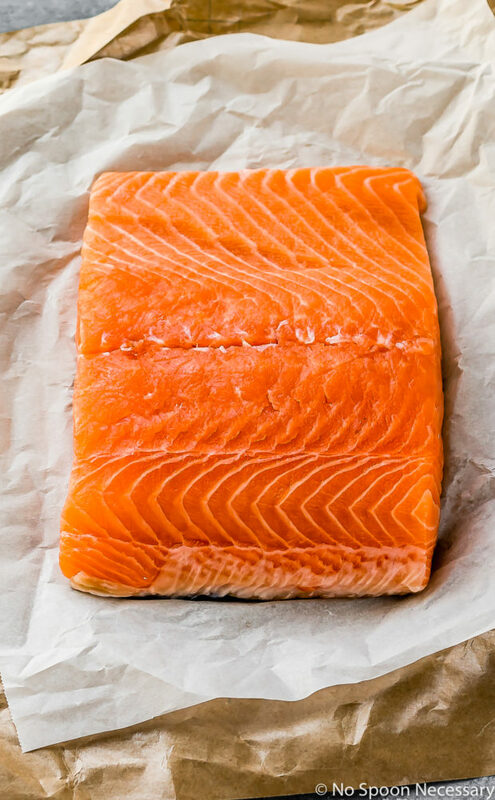 To thaw cooked salmon, either transfer the frozen salmon to the refrigerator overnight, or immerse the salmon in its zip-closure bag in cold water. How to reheat baked salmon? The best way to reheat salmon is to reheat it over low temperature, slowly, as you want to avoid dry overcooked salmon. 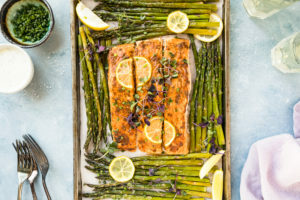 To reheat salmon in the oven, tent the salmon loosely with foil on a baking sheet and warm it in an oven preheated to 275 degrees F for 15 minutes, or until the salmon is warmed throughout. Fair warning, while reheated salmon is good, it is never as good as it was fresh from the oven. With that said, it’s one of the reasons I personally like to eat leftover salmon cold! It’s delicious served chilled as the salmon retains its flavor and moisture. Try it! If you can’t find a whole salmon filet, or simply don’t want to use one, do not fret! 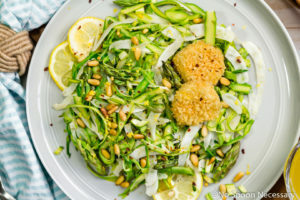 You can absolutely substitute 4 (6 ounce) filets instead. However, if your filets are thick, keep in mind you will need to cook your salmon for a bit longer. I recommend keeping an eye on your brussels sprouts. If they are roasted to your liking before the salmon is, remove them from the oven while the salmon finishes cooking. Just transfer them to a serving bowl and tent with aluminum foil to keep them warm. The brussels sprouts taste amazing tossed with the Dijon and honey mixture. There is plenty of mixture, so if you want to remove a few tablespoons to toss with the sprouts, DO it! The length of time the salmon needs to cook in the oven depends on your preference and the thickness of your salmon. I cooked mine for a total of 13 minutes and it was cooked exactly to my liking, medium (145 degrees). 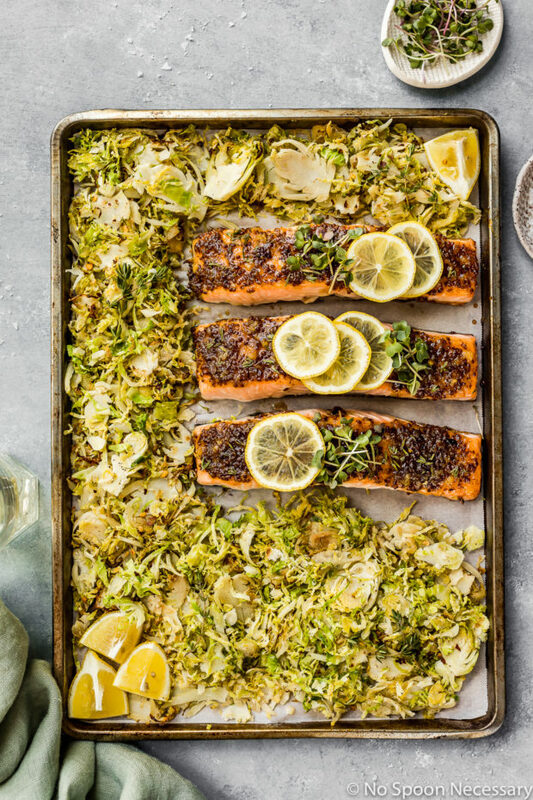 Only one pan, a handful of easy steps and 25 minutes stand between you and this scrumptious Sheet Pan Baked Honey Dijon Salmon with Brussels Sprouts dinner. So what are you waiting for? Tick tock, tick tock. Go do the dang thang! Until Thursday friends, cheers – to impossibly easy meals. Sticky, tangy, sweet and savory glazed salmon paired with thinly sliced, crisp yet tender brussels sprouts. 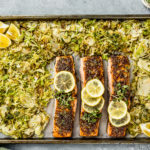 This Sheet Pan Dijon & Honey Glazed Salmon with Brussels Sprouts is healthy, delicious, only requires a handful of ingredients and can be on the table in 25 minutes! Preheat oven to 425 degrees F. Line a large baking sheet with parchment paper or aluminum foil for easy clean up. Add brussels sprouts to pan, drizzle with olive oil and season generously with salt and pepper. Toss to coat and push sprouts to one side of the baking sheet. Pat salmon dry using paper towels and place salmon next to the sprouts on the baking sheet. Season salmon and sprouts generously with salt and pepper. In a small bowl mix together the honey, mustard, ginger, garlic and red pepper flakes. Whisk until well combined and smooth. Transfer ¼ cup of mixture to a small bowl to use as a glaze and stir in thyme. Set glaze aside and reserve to use later. Brush the Dijon-maple mixture generously on top of the salmon. Remove from oven and transfer brussels to a serving bowl or plates. Allow the salmon to rest for a few minutes before cutting into desired portions. Serve with lemon slices and fresh thyme if desired. Enjoy. 1. You can substitute 4 (6 ounce) filets instead of one whole salmon filet. However, if your filets are thick, keep in mind you will need to cook your salmon for a lot longer. I recommend keeping an eye on your brussels sprouts and removing them from the oven while the salmon finishes cooking. Just transfer them to a serving bowl and tent with aluminum foil to keep them warm. 2. The length of time the salmon needs to cook in the oven depends on your preference and the thickness of your salmon. I cooked mine for a total of 13 minutes and it was cooked exactly to my liking, medium (145 degrees). 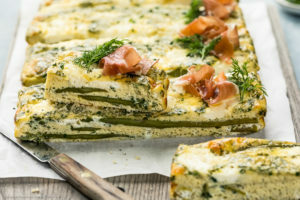 I am loving the look of the salmon and specifically your topping. However, my biggest takeaway is to use my food processor for our brussels sprouts. 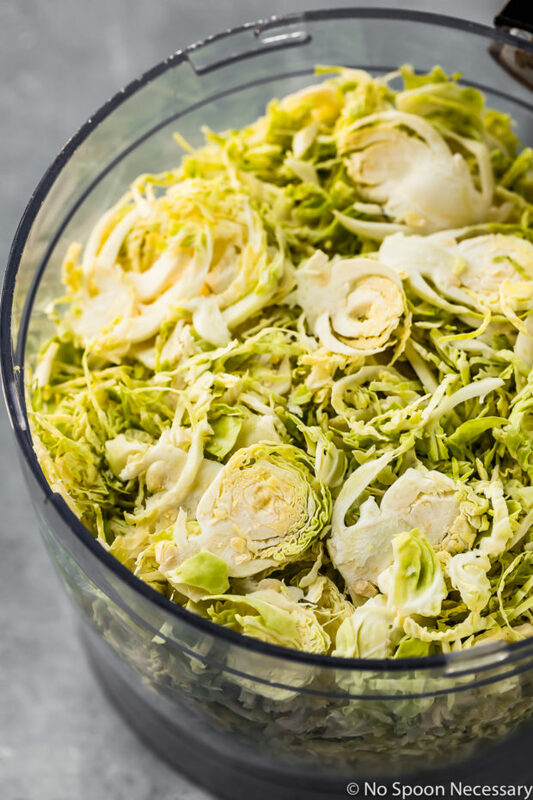 My wife and I have brussels sprouts 2 times per week – #TimeSaver. This was a delicious combination. For the glaze I used a German stone ground mustard and ginger paste. The salmon was moist and uniquely tangy. The brussel sprouts were not too oily and did not have an overly strong taste. A balsamic glaze dribbled over the brussel sprouts after cooking tasted good. What a great idea Chey! 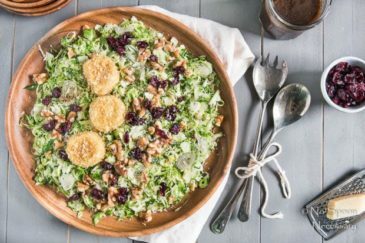 I’m a huge fan of sheet pan dinners, and I love the shaved Brussels…so good! This will definitely be in my repertoire for the week! 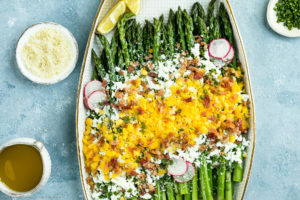 Nothing easier than a sheet pan meal! And this one looks right up my alley Chey! All my favorite things! Pinned and can’t wait to get it on the weekly menu! 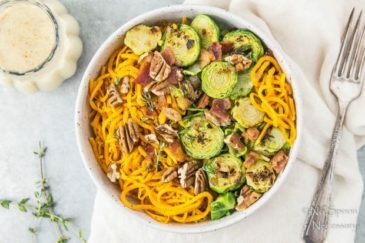 Salmon is my favorite fish and brussels are up there amongst my favorite veggies so I feel like this recipe was created just for me :). Seriously, it sounds amazing! Is anything better with salmon than a little Dijon? I don’t think so!